IE Singapore is the key driver of Singapore's external economy, with 39 offices across six continents. It prides itself on promoting our nation's bustling business and trade hub to the world, and priming Singapore companies for growth and market penetration overseas. Many local companies such as Love, Bonito have benefitted from IE Singapore's invaluable assistance. IE Singapore's global identity gives IE Singapore scholars the chance to help local businesses open doors in different regions. In fact, IE Singapore scholar Faridah Mohd Saad has just been welcomed as Centre Director in IE Singapore's Johannesburg office. 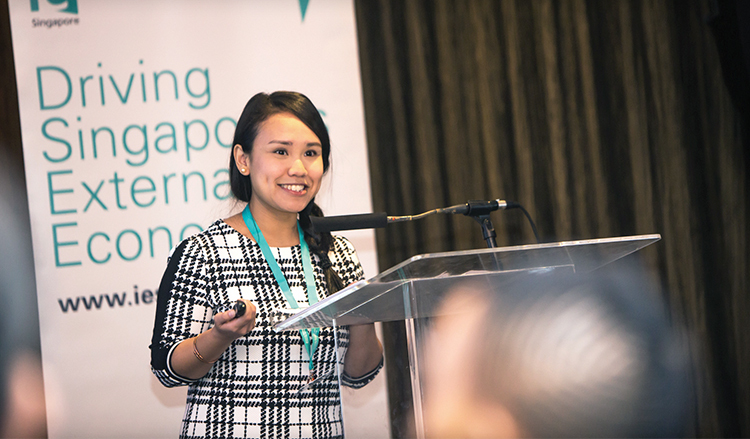 Faridah first started her career at IE Singapore in 2011 with the Project Development Group, before joining the Middle East and Africa Group in December 2014. Her position in the Middle East and Africa Group prepared her for her current position in Johannesburg. To the undiscerning eye, Faridah's job in the Middle East and Africa Group might seem like a risky undertaking. However, the sanguine individual is quick to address these unwarranted concerns, explaining, "People often perceive Africa as a continent that is war-torn, conflict-ridden and threatened by health epidemics. They fail to realise that Africa is the fastest-growing continent after Asia, with a trillion-dollar combined economy and a population of over 1.2 billion. There is indeed massive, untapped potential for Singapore companies to invest and trade there." IE Singapore's mandate to champion internationalisation is something with which Faridah strongly resonates. The political science graduate applied for the scholarship because she was drawn to both serving in the Public Service as well assisting local entrepreneurs to grow locally and abroad. Throughout her time with IE Singapore, she has contributed to the fulfilment of various exciting projects. For instance, she helped a Singapore company build its first green-building showcase in Cambodia during her tenure with the Project Development Group. This project saw her working with key government and industry organisations in Singapore and Cambodia, in order to meet the objective of reducing logging activities and greenhouse gas emissions. Given their regular dealings with various countries, IE Singapore officers are prepared for overseas collaborations through foreign language lessons. This range of language lessons - which includes German, Portuguese and Russian among many others - are also available for HQ officers with an interest in the language. Faridah herself speaks three languages for work - namely English, Bahasa and Portuguese. To date, Faridah has travelled to 11 countries for work and claims Cambodia's countryside to be her most exotic work destination. Having gone through such dynamic experiences, Faridah hopes to share her thoughts with aspiring IE Singapore scholars. She tells us, "IE Singapore seeks to nurture global-ready individuals who possess strong cultural awareness and an international outlook. It is also important to embody an entrepreneurial spirit as much as your companies do, because ultimately you are the ones opening the doors to the overseas markets. "Aspiring scholars must believe in IE Singapore's mandate to assist Singapore companies as they enter into global markets. Not having a fear of flying will also bode well for your future overseas stints and postings!" NCSS offers the Social Service Scholarship to support individuals who yearn to make a difference. We hear from Social Service scholar Alvin Mak, who shares with us about his unique challenges and fruitful journey.